Most State rules of professional conduct equivalent to ABA Model Rule Section 1.17 regarding the sale of a law practice provide for a 90 day grace provision. In other words, ownership of the law firm cannot be transferred before giving notice to clients at least 90 days ahead of the transfer of ownership. The theory is that clients require an opportunity to seek different advisers/counsel, gather, and transfer their files to new counsel should they choose to do so. This is for the benefit of the clients. It is also the hope that the outstanding indebtedness to the lawyer, accounts receivable, will be paid in the same period of time. The client may also use this occasion to negotiate a lower outstanding balance in exchange for immediate payment. Or, the client may retain the Buyer pays in accordance with previous terms. Most lawyers believe their client relationship is personal and cannot be transferred, that a client relationship cannot be severed and transferred because it is personal and of long duration. Likewise, this is the concern of the buyer who fears the future revenue of the firm will decrease. In my experience, though, the buyer is purchasing an income stream, not client files, thought the latter is the basis of the former. And the decision most often is made based on the BUYER's attitude and performance, not the seller's. Thus, the relationship of the client to the firm remains intact. With a recommendation from the seller to the clients, the client will normally follow the guidance of the selling lawyer just as he did concerning previous legal issues. That's the starting point; beyond that, it is up to the buyer to pay attention to the relationship, provide equal of better service and legal skills...and the income stream will likely continue or improve. The current state of the law is a bit unsettled and requires greater care than in previous times; existing and maturing law firms continue to grow; the lawyer population continues to age and lawyers are looking for more effective ways to develop their own exit channels. 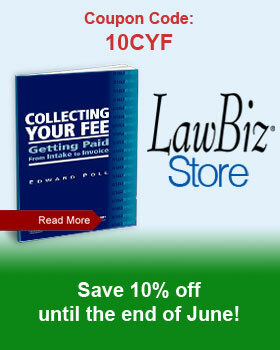 Rather than follow the steps provided in Rule 1.17, some lawyers seek to merge and take a percentage of future revenue collected from the continuing steam of revenue. By merging, the steps of 1.17 can be nuanced as this is not a "sale." The lawyer can continue to work with little or no interruption for the client. Other challenges also are avoided. Most buyers want to be convinced they will receive that which they expected and paid for. However, this does not result or occur in isolation; buyers/lawyers fail to acknowledge that they are intimately involved in the process. One cannot buy a law practice and have it run by itself; once you're involved, the future success is dependent on you, the buyer, all other things being equal. The buyer must deliver the same or better service as the seller, the same or lower legal fee, and the same or better legal skills, at least in the short term. The same protection can be given to the buyer in a manufacturing or distribution context as well as a professional service context. Saying lawyers are different or special does not make it so. Bottom line is that service and quality and price are paramount. A personal handoff from the selling lawyer to the buying lawyer is essential .... And the follow up by the buying lawyer will seal the deal.